Paradise Island, Beach area next to "The Reef" at Atlantis Resort. I was vacationing in the Bahamas. Since it's s private beach, you'd need to be vacating at Atlantis. 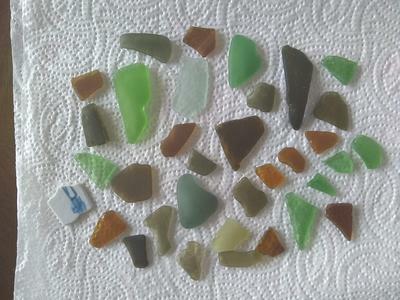 I looked on two different mornings, finding about 60 pieces of seaglass. Most were frosted. I found two shades of blue, several shades of green, one yellow, some brown. Most had smooth edges. They were in small to much larger pieces. I also found an old pottery shard. While I was there, no one else was looking for anything on the beach. I walked from the Reef building toward the lighthouse on the point, as far as I could go before coming to rocks that prevented me from proceeding further on the beach.